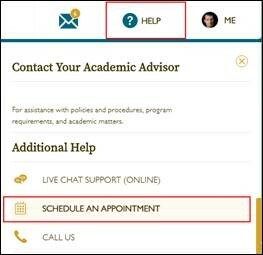 To schedule an appointment with your Student Success Advisor, start at your myWalden portal. Click the Help icon at the top right of your myWalden portal. Beneath the Student Success Advisor area, select your degree level (unless you are an international student, in which case select International). Select your area of study and hit continue. Select All for the day of the week, start time 6:00 AM and end time 9:00 PM [all times are listed in Eastern Time, or GT -5], and then select your advisor's name from the list of available advisors. Please note: Leaving the weekday and time options open will help you find more available appointments. If you are only able to speak with an advisor on certain days or at certain times, you can limit these fields as needed. Select Find Appointments to see a full listing of available times. Click on the radio button next to the appointment slot that you would like. Select the reason for your appointment and fill out the form. Please note: Your phone number may not fit in the space provided. Just fill in as much as is necessary. Student Success Advisors have your number on file and will be able to pull it up. If you wish for your advisor to call you at another number for the appointment, please send an email to your advisor to let him or her know.